If you're a musician, the best way to ensure you'll be getting royalty checks well into old age is to belt out some tune that DJs will be forced to whip out year after year, such as "The Monster Mash," or "School's Out (For Summer)." 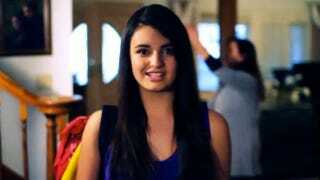 Rebecca Black may have taken things to the next level. In a blog post, YouTube reports that her music video has seen a spike on every Friday since it went viral, as apparently everyone loves lookin' forward to the weekend with Rebecca Black.